C-Path President and CEO Martha Brumfield, PhD, and C-Path Board Director Alastair J. 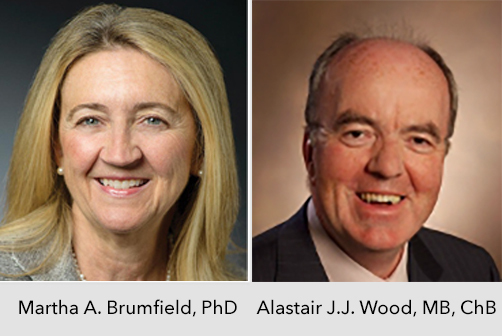 Wood, MD, FRCP, have both been selected to the serve on the National Academy Consensus Committee examining Mutual Recognition Agreements in the Regulation of Medicines under The National Academies of Sciences, Engineering and Medicine. Dr. Wood will serve as chair. An ad hoc committee, the National Academy Consensus Committee examining Mutual Recognition Agreements in the Regulation of Medicines will review and assess the use of mutual recognition agreements, the agreements which allow regulators to rely on information from their counterparts at foreign drug regulatory agencies, in medicines regulation. The analysis gives particular attention to how national medicines regulatory authorities use such agreements and the effects agreements have on public health, use of resources and essential regulatory competencies. Learn more about the project scope and view the full list of committee members, here.